Villa Cora is a fabulous place on the hills above the city center and not far from Piazzale Michelangelo. The few times I have been invited there, I was always afraid I would have toothpaste on my blouse or in any other way look weird in this elegant place among well put together people. The same went for this dinner by the pool, where I tried to not drop the food or spill the Sangervasio wine which always happens, sort of like Murphy’s Law when it ought not to happen. Anyway, I managed to behave and look quite serious too, but I kept looking at the pool thinking it would be so cool to just do something spontaneous like dive in and go for a swim. 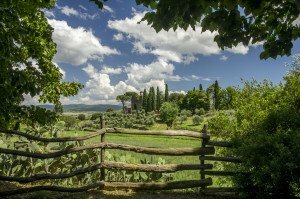 The San Gervasio estate is situated in the small hamlet San Gervasio not far from Pisa. The hamlet dates back to the 8th century when it was established as a defense of the local roman parish church. The castle close by was built in the 10th century and at some point, it also ended up as the property of the Della Gherardesca family. In the 1960s, the estate was bought by Furio Tommasini who completely renovated the place. 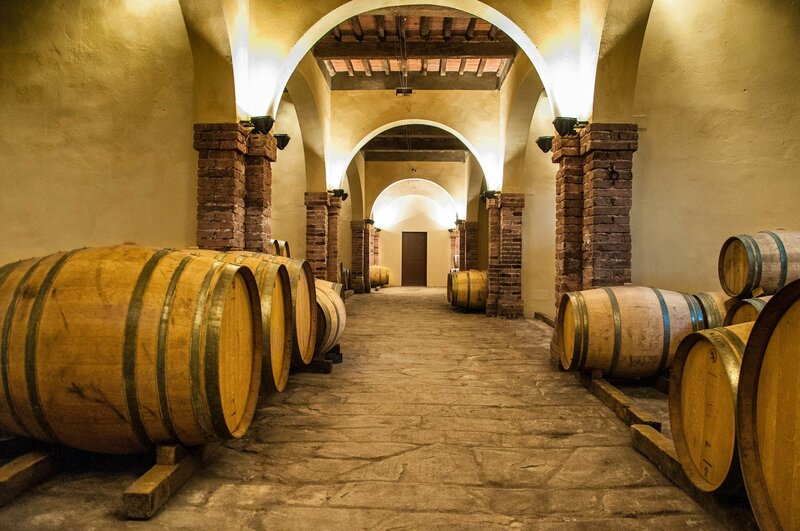 For several years, they only produced bulk wine but around 20 years ago Luca Tommasini, the son of Furio, decided that they needed to change direction and start producing a high quality bottled wine. Since that point, Luca is now in charge of the San Gervasio wine production. 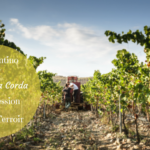 They started to change and reduce the density of the vine stocks in the vineyards and to focus on developing the processes from vineyard to winery in order to produce a wine of better quality. The winery is organically certified since 1996 and nowadays they also follow the concept of biodynamic agriculture. Furthermore, they only apply natural fermentations on their wines since 2003. The estate comprises almost a 1000 acres of land but only 55 acres are vineyards. Here they cultivate Sangiovese, of course, but also Merlot, Cabernet Franc, Cabernet Sauvignon, Chardonnay, Vermentino, and Sauvignon Blanc. At Villa Cora, I met both Luca Tommasini and his daughter Lisa, with whom I talked a lot. 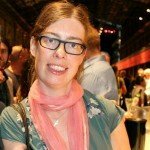 Lisa now also works in the family winery dealing with the more commercial and social media side. She told me that they sell almost more than 80% of their production abroad, to countries such as Japan, Brazil, USA, Northern Europe, etc. They produce several different wine labels, but here I will only talk more in detail about 3 of them that we tasted at the dinner. 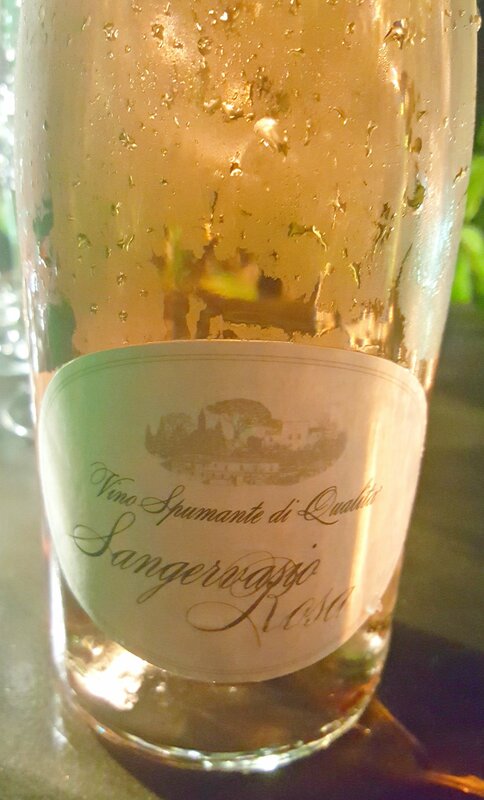 Sangervasio Rosa – This is a 100% Sangiovese sparkling wine made with the Charmat method in autoclave. It is then refined for 3 months in bottle. It is a very fresh sparkling wine with notes of white fruits and raspberry. It was perfect as an aperitif wine at the summer evening at Villa Cora. Sangervasio Bianco – This is a white wine made of 65% Vermentino, 25% Chardonnay, and 10% Sauvignon Blanc. The Vermentino is an indigenous grape in Tuscany and it often gives its best expression when cultivated along the Tyrrhenian coast. It is a fresh and mineral wine with notes of mature apples and pineapple as well as a slightly spicy touch. 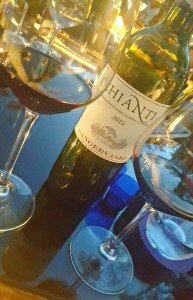 Sangervasio Chianti DOCG 2015 – This a 100% Sangiovese wine which has undergone the fermentation and then been aged for 6 months in cement tanks, and after that at least 4 months in bottle. It is a ruby red wine with notes of violet and a beautifully pronounced touch of red fruit which is typical for the Sangiovese grapes. We also had an olive oil tasting during the evening with three different products from Eleonora di Toledo. This is an estate situated close to Campiglia in Tuscany, which is not far from the seaside. It was founded in 1996 and the name was chosen in order to honor Duchess Eleonora di Toledo who in the 16th century spent her summers at this estate. For those of you who might wonder who Eleonora Álvarez de Toledo y Osorio was, she was one of many children of the marquise and viceroy of Naples, Pedro Álvarez de Toledo y Zúñiga and his wife Marchesa Donna María Osorio y Pimentel. In 1539, at the age of 17 she married Cosimo I de’ Medici Duca di Firenze who further on would become Grand Duke of Tuscany. Four years ago, Lara Landi took over the management of the family estate and olive oil production. Her aim is to produce a high-quality olive oil which reflects the specific local territory. They are working towards becoming organic in accordance with the local regional regulations to reduce the use of chemical products to a minimum. The high quality can furthermore be ensured by the fact that they entirely control their production chain from the olive grove up until the bottling of the oil. In this way, they can guarantee that their oil is not mixed with other olive oils of lesser quality. In total, they produce around 20,000 liters of olive oil per year. Here the journalist Stefano Tesi is tasting and analyzing the different olive oils from Eleonora di Toledo. And I am sorry about the bad audio quality, but at least you can get a feeling of it all. They cultivate olives from four different cultivars, namely Frantoio, Leccio del Corno, Moraiolo, and Pendolino. They then produce four different E.V.O olive oils with the name ”Eleonora” which corresponds to the four different cultivars. They also produce the Eleonora Extra Vergine Olive Oil which contains a blend of a careful selection of olives from the four different cultivars. So, I apologize if this article deviated a bit from the main topic in the beginning, but sometimes it can be good to have a bit of fun. Returning to the olive oil and wine, Eleonora di Toledo is an olive oil producer striving to produce high-quality products that are an expression of the local territory and tradition. The Sangervasio winery is also putting much value into territory and tradition at the same time as they are respectful of the environment. 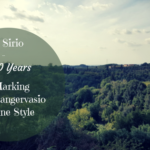 Their Sangervasio Rosa sparkling wine is indeed perfect for a summer aperitif and their Chianti DOCG is a good example of a local 100% Sangiovese wine. So go and try them out! 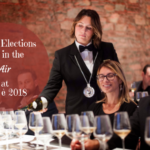 See also the journalist Aldo Fiordelli presenting the Chianti DOCG from the Sangervasio winery here. Thanks Audrey, yes, it was a great evening there. I really enjoy sparkling wines. 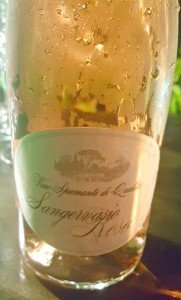 The Sangervasio Rosa wine will be one I try next. Thanks for sharing. Oh, yum! What a beautiful setting to taste those lovely wines, and the olive oil. I feel like I just had a mini-vacation – thank you. What a beautiful world of elegance (and fun, thanks to the very cute video), wine, olive oil and lovely scenery. I agree, my inner child would find it very challenging to sit by the pool and not jump in! 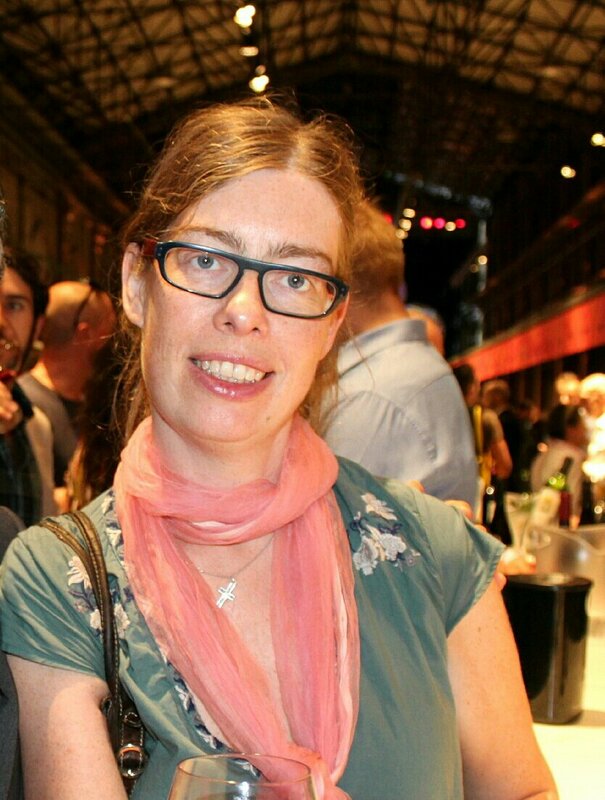 How wonderful to know you have a bio-dynamic winery in your area, Katarina. Farming this way produces the highest vibration crops of any other method. Although I don’t drink wine, I imagine the Sangervasio wines really are a taste above all others from this region and probably from other regions too. I would be curious to know if you actually can taste the difference in them, being that you are such a wine expert! Thanks for sharing a bit about your travels and the wonderful adventures you are having with such a wide variety of wineries. As a non-wine drinker I can appreciate the beauty of your life. So nice you get these invitations to these beautiful places. 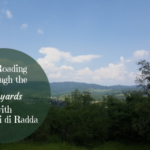 It is a treat to have this glimpse of your life, wines, Italian country side, & a luxurious hotel. 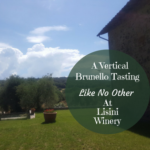 As, I am a non-wine drinker as well, I really do must admit I love how you share your experiences you have at various wineries and just cool places! Beautiful pics too! I love a great olive oil so tasting them would be wonderful. Where I live we have a place called Pinch and Pour. They have excellent olive oils that you can taste. I love the smell and the experience. 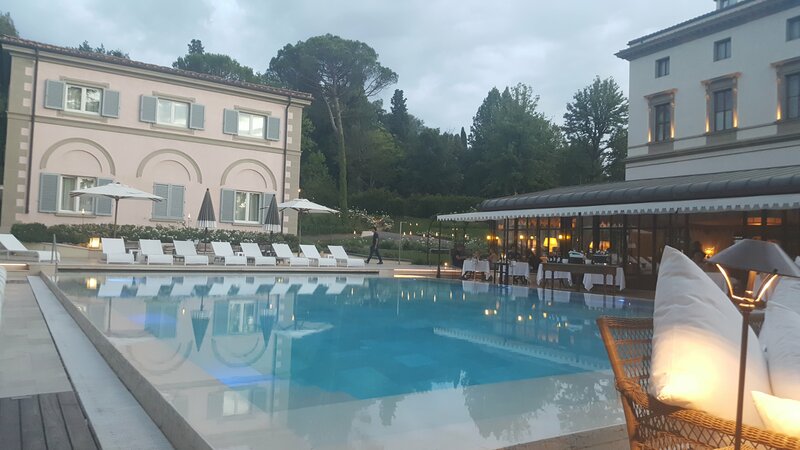 Oh Katarina, you make we want to get on a plane and head directly to Villa Cora. That’s the best marketing video I’ve ever seen. I’m also impressed how you have mentioned the organic and biodynamic practices. Obviously, there is a recognized value to returning to healthier land for growing. Thanks Joyce, yes, organic and in some sense biodynamic start getting more and more important in order to produce a good wine. So you just drink olive oil in a tasting, like you would wine? I think I’d need veggies or crackers or bread or something. Olive oil by itself can heavily influence the taste of food it’s cooked with and I’m not sure I could take more than just a wee bit to taste! 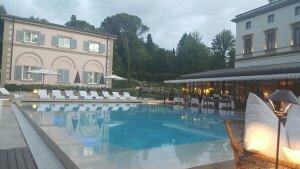 Villa Cora looks amazing, and fun too. What a wonderful setting to sip on delicious wine and sample olive oil. What a lovely setting for sipping and socializing! It looks like a lovely way to spend a weekend.